2016 event sponsors, be sure to support these wonderful companies who have supported us and the hobby. We will add them to the list as names become available. 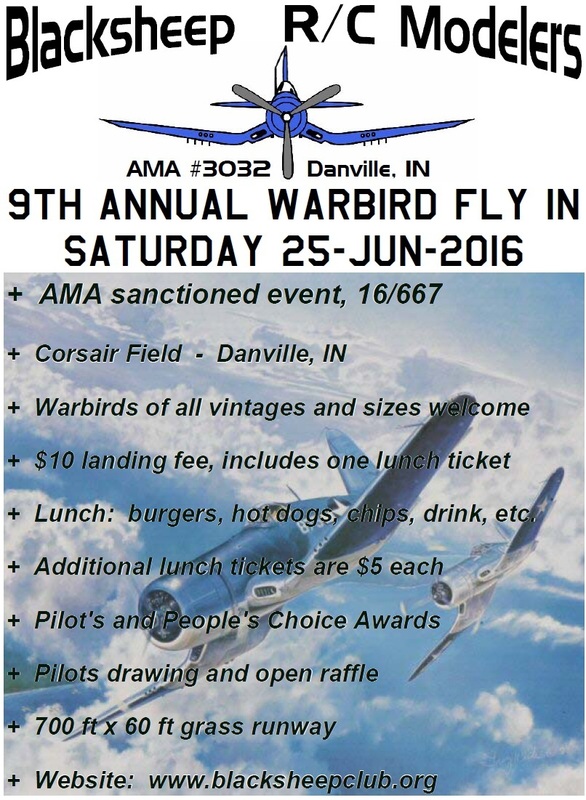 This year was our 9th annual Warbird event. 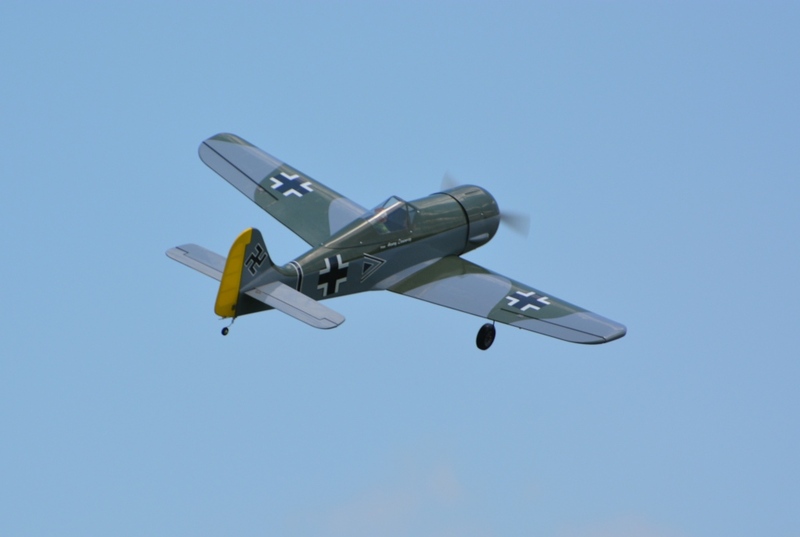 Everybody loves to watch Warbirds fly, any type, any size and we all love to fly them. Our event was AMA sanctioned again this year, sanction number 16/667. 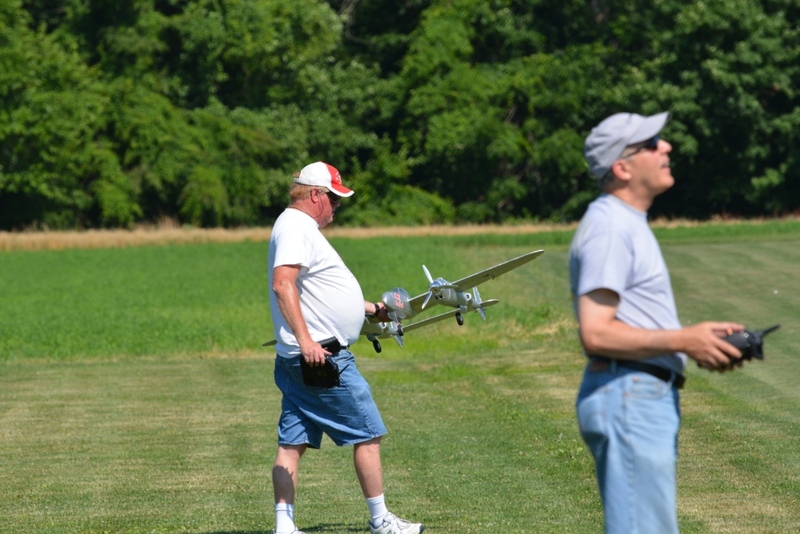 As in our previous warbird fly ins, we had hamburgers, hot dogs, chips, soda and desserts for lunch. Why change a good thing. 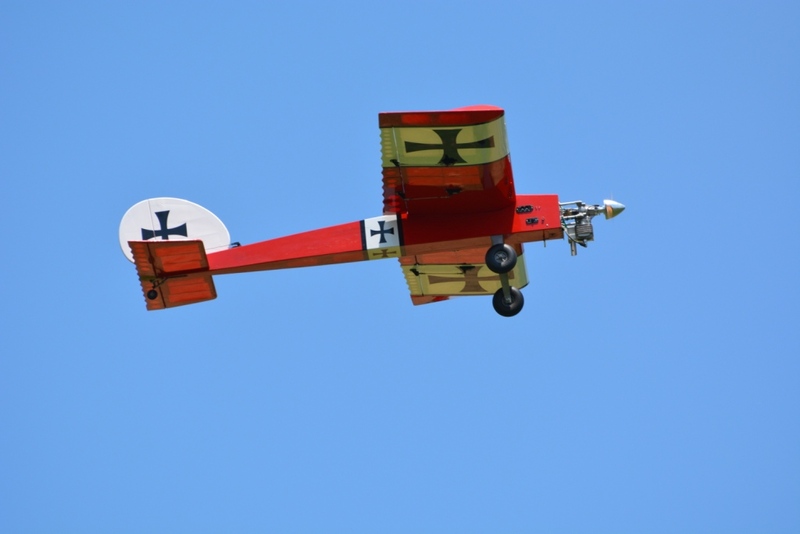 Each pilot registration included a lunch ticket with extra lunch tickets for $5. 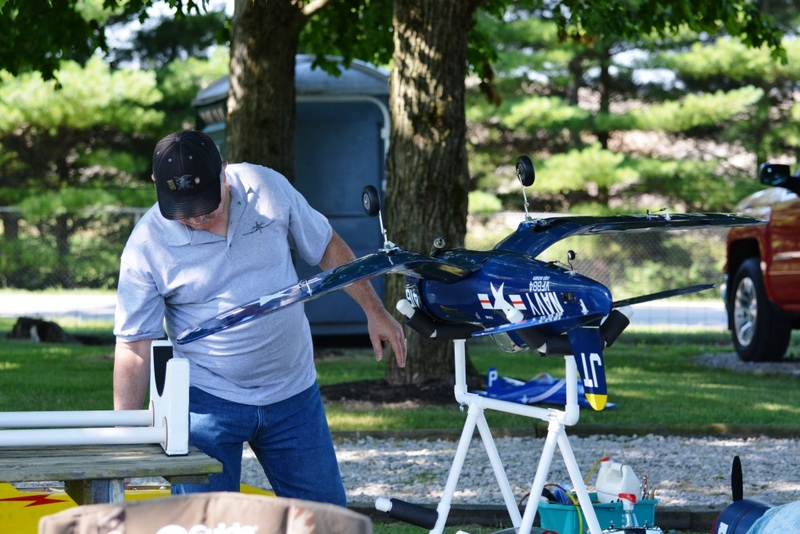 Including the 28 registered pilots, we had over 70 people enjoy lunch. Great job on the grill by Joe Hartsock and Dave Miller. 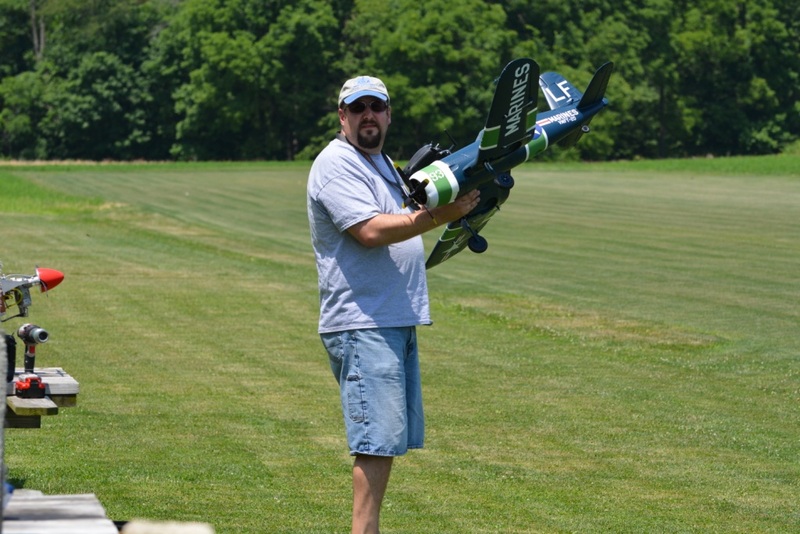 The weather cooperated today, about 90 degrees, light winds and low humidity made for a great day for flying. Thanks to Tom Hatfield and Tom Hatfield for a fantastic field. I don't think it has ever been better. 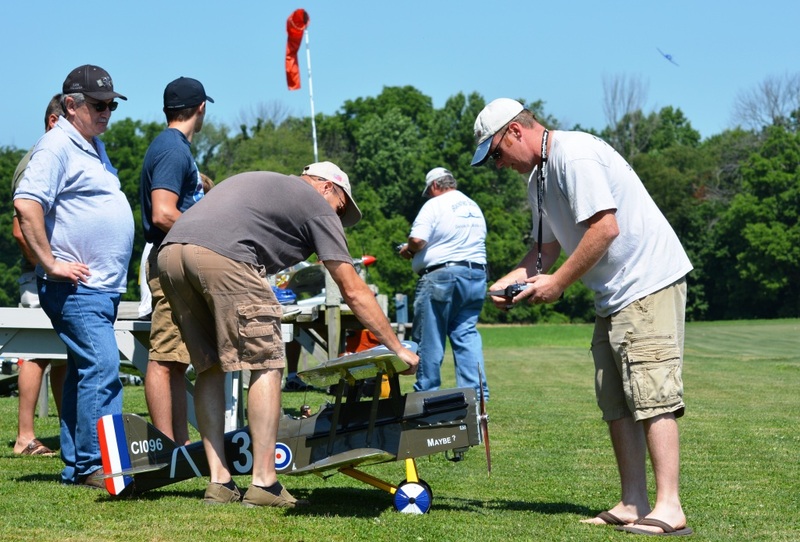 We had plenty of shade and water for pilots and spectators. 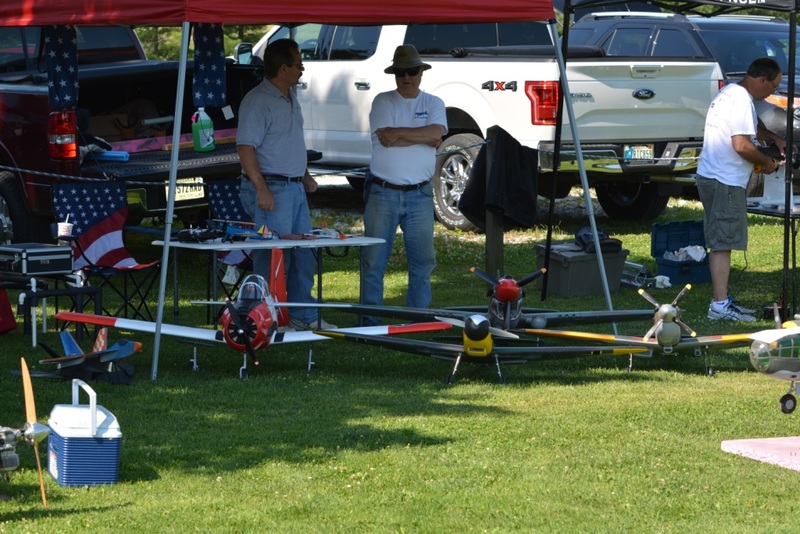 Again this year all registered pilots were able to take home a gift, thanks to all our event sponsors. Please support those who support our event. Really looking forward to our 10th annual next year! 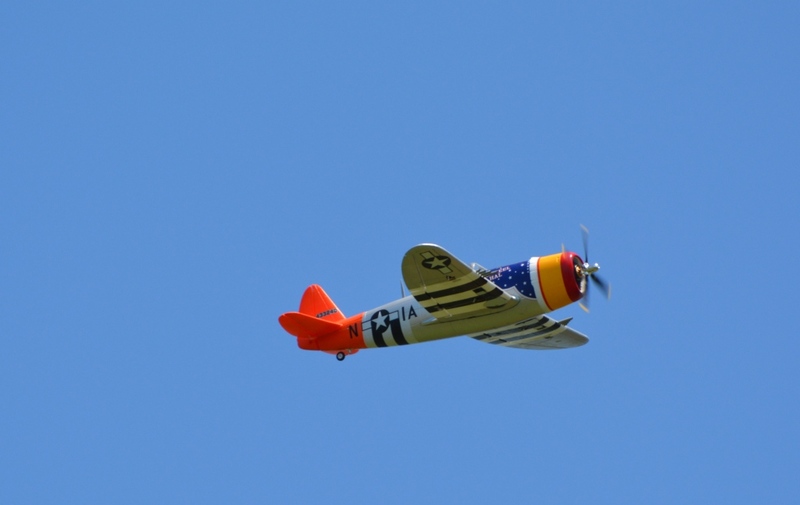 Pilot's Choice: Roger Dohm for his E-Flite 80" electric B-25. 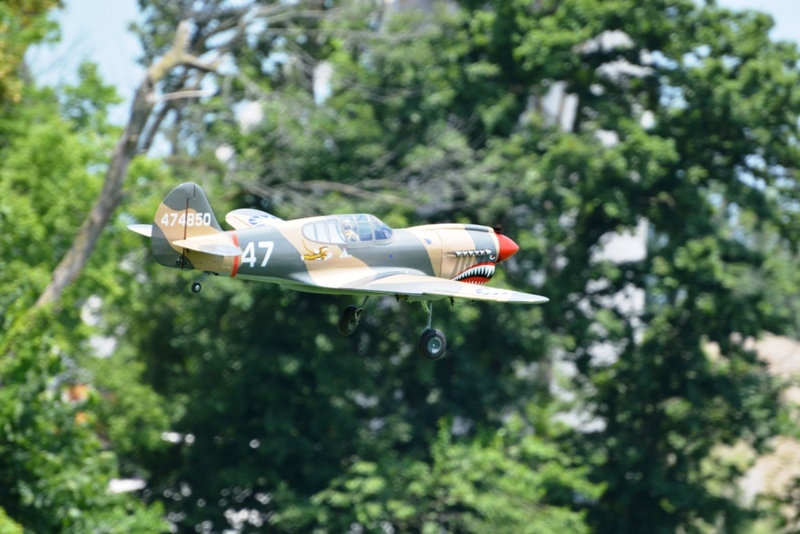 People's Choice: Kyle Busman for his Top Flite 86" P-40 Warhawk powered by a Turnigy 50 with a scale exhaust and 3 blade prop. 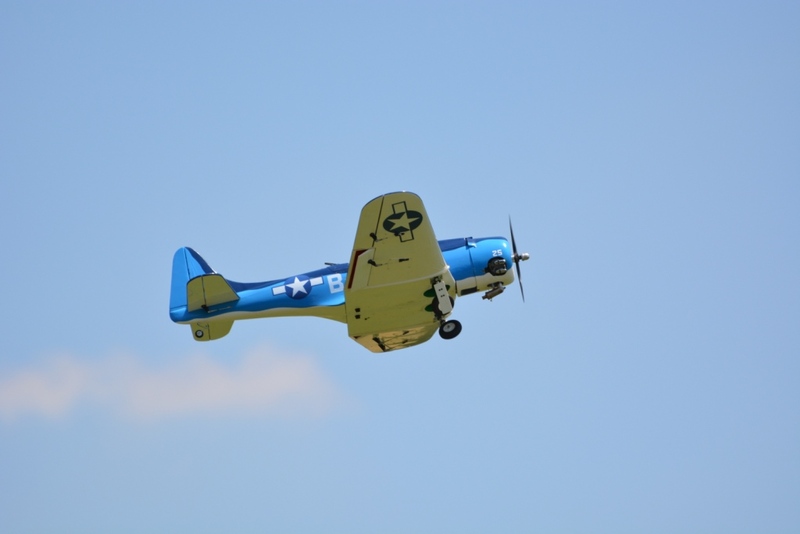 Director's Choice: Tom Carlyle for his Hangar 9 65" wing span Corsair. Powered by a Saito 100 4 stroke. 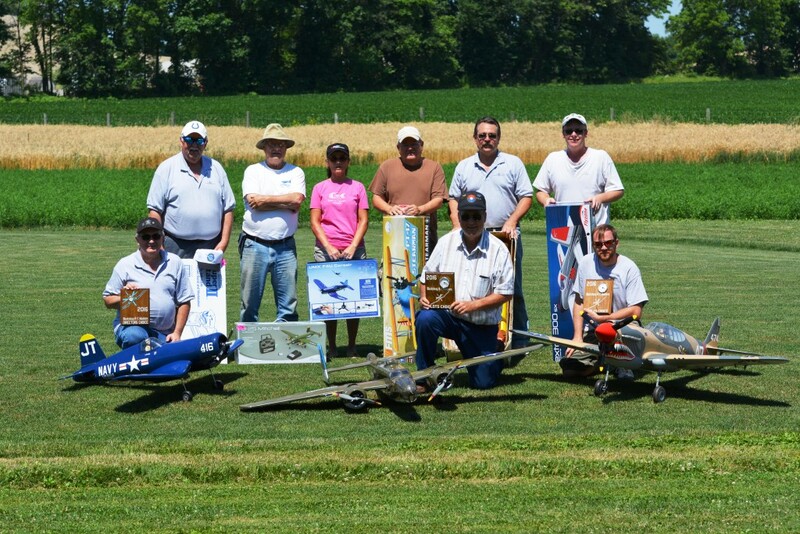 Photo of the raffle winners and event plaque award winners. 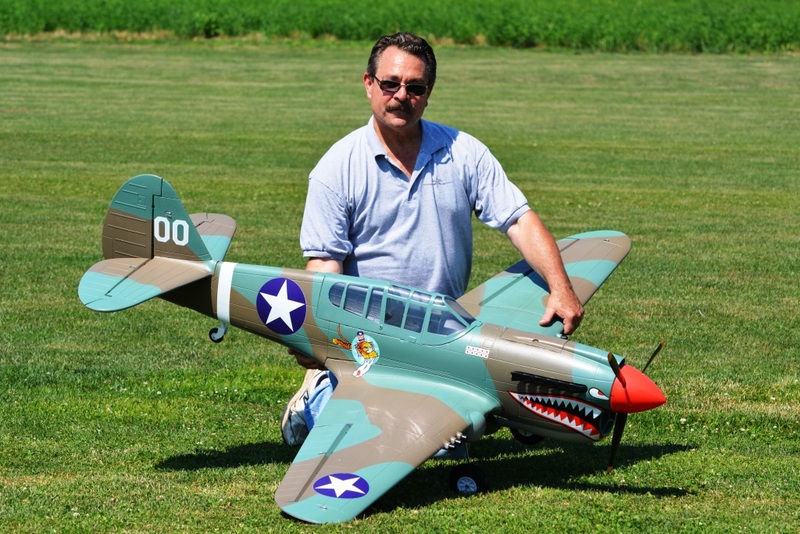 Don Schmedake with his 15cc gas powered Hangar 9 P-40. Col. Dave Miller (that's what is says on the side of the plane) with his Hangar 9 P-47 Thunderbolt. 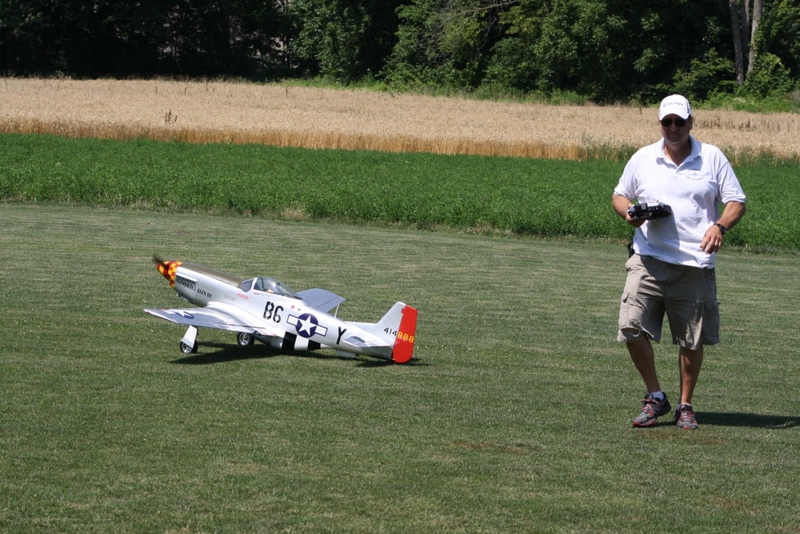 Scott Martin taking his Hobby Zone Zero to the runway, flies well and drops a bomb. 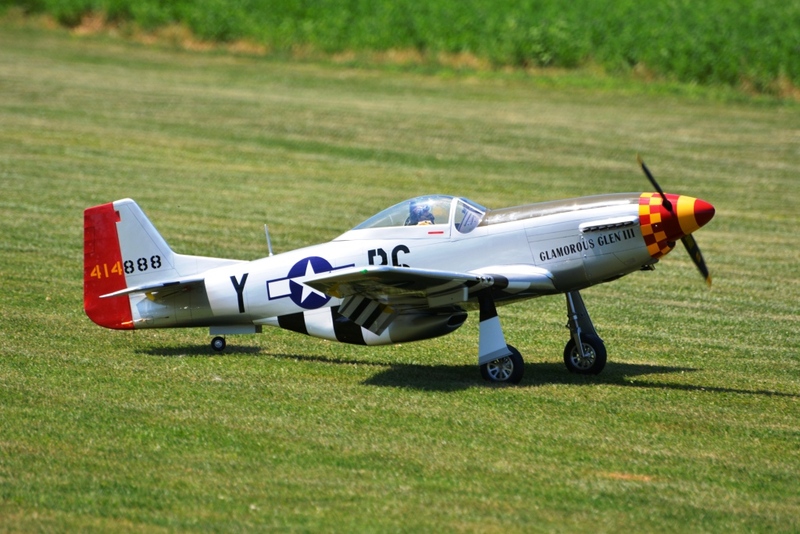 Rege Hall with his Hangar 9 89" P-51 Mustang. Powered by a DLE 60. 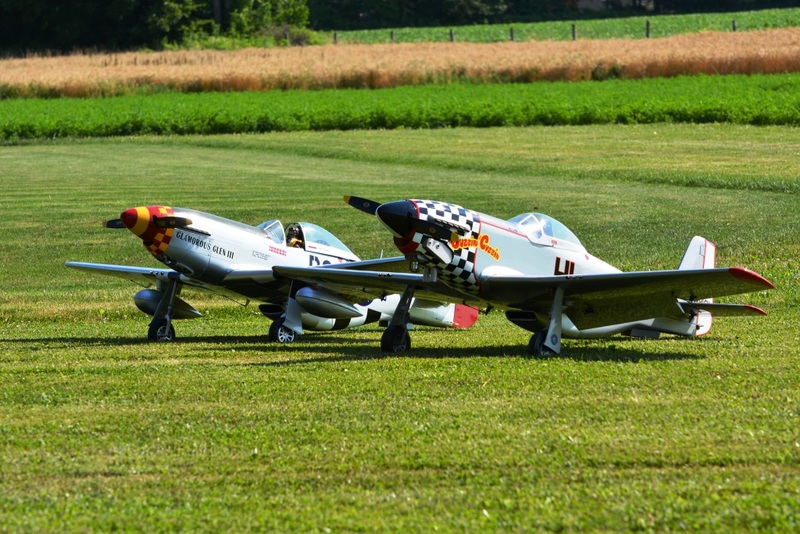 Rege Hall's Glamorous Glennis P-51 and John Louden's Buzzin' Cuzzin' P-51 Mustang. 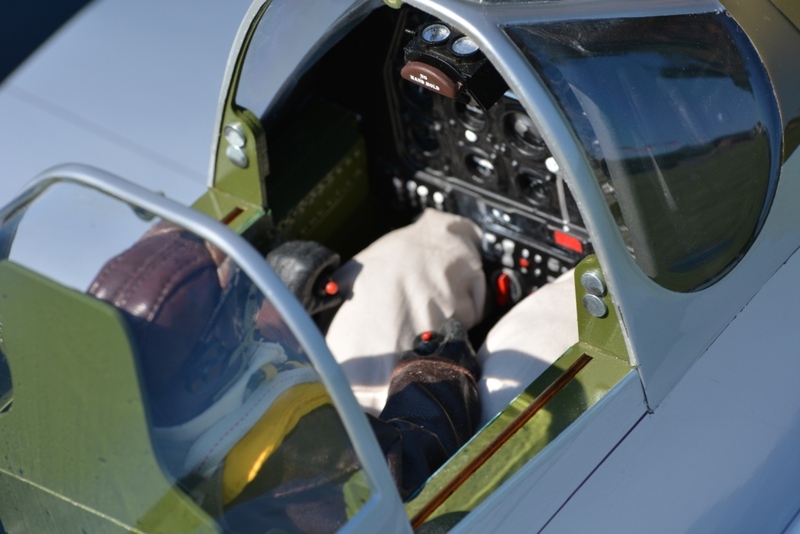 Cockpit of Rege's Glamorous Glen III P-51 Mustang. 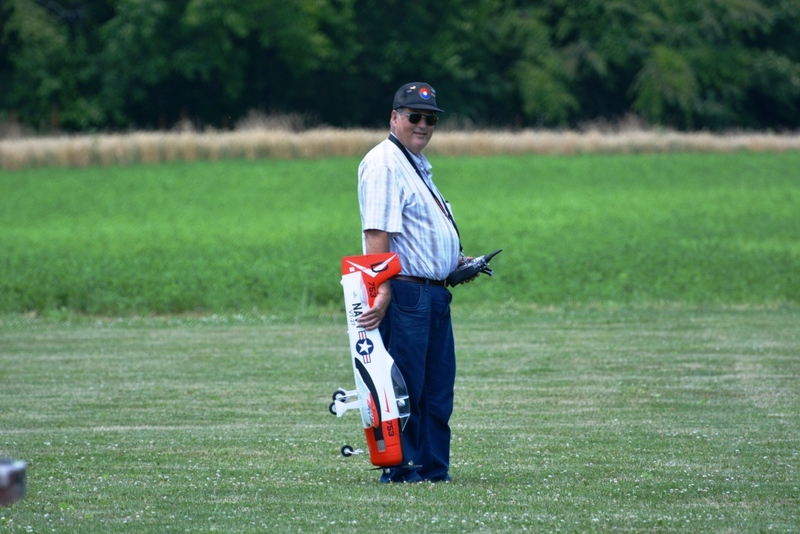 Wayne Jones with his Nachang CJ6. 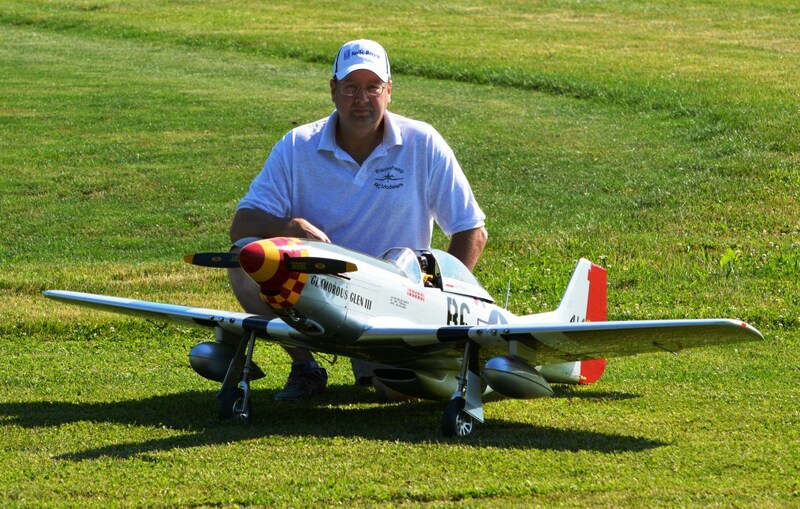 Joe Hartsock with his .46 size P-51 Mustang. 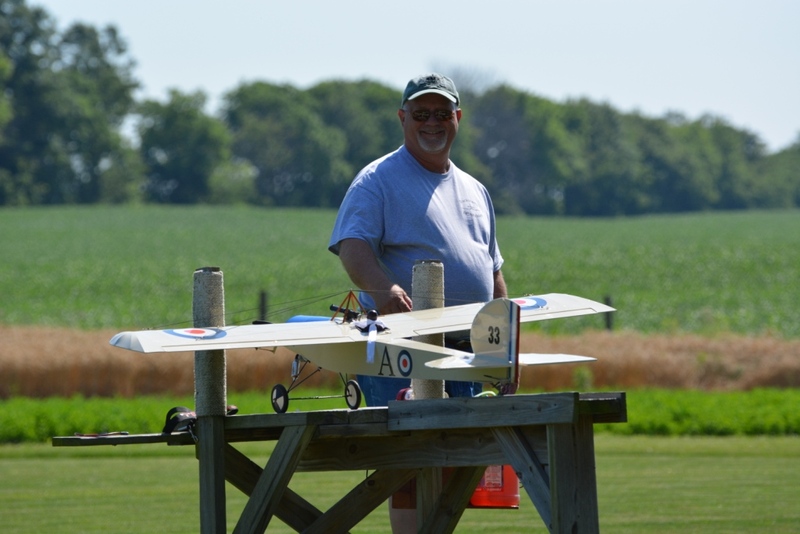 John Louden's Balsa USA Neiuport. 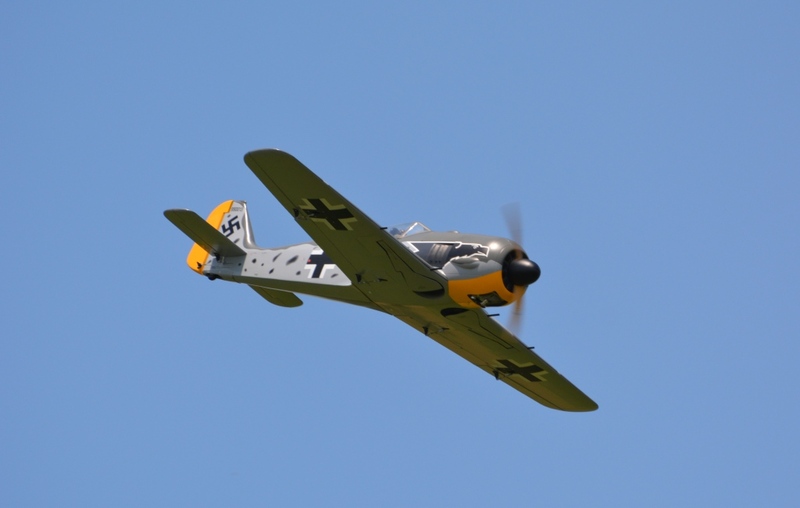 Jerry Nugent flew his electric Corsair many times during the day. Nice to have out of club guests to share our field with. 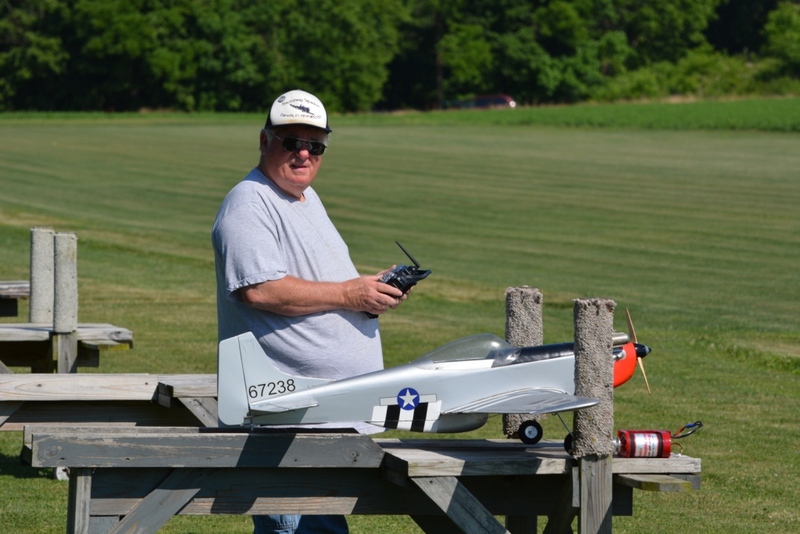 John Louden with his kit built Balsa USA Neiuport. 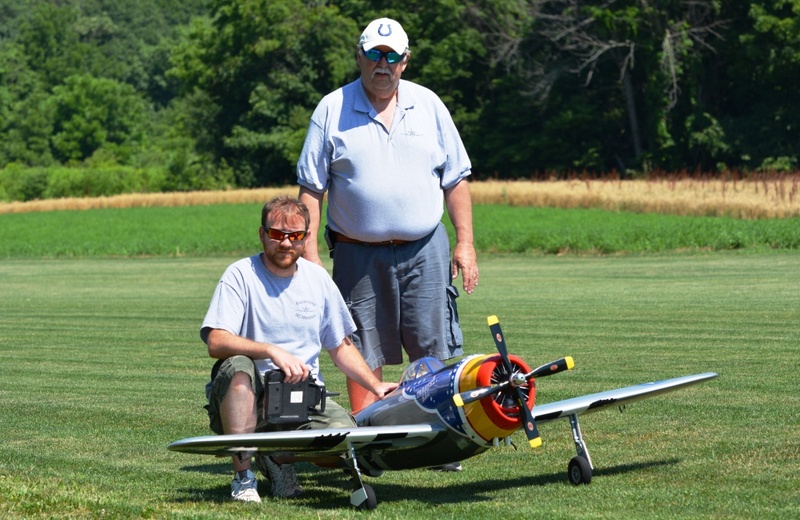 Tom Carlyle with his Directors Choice Hangar 9 Corsair. 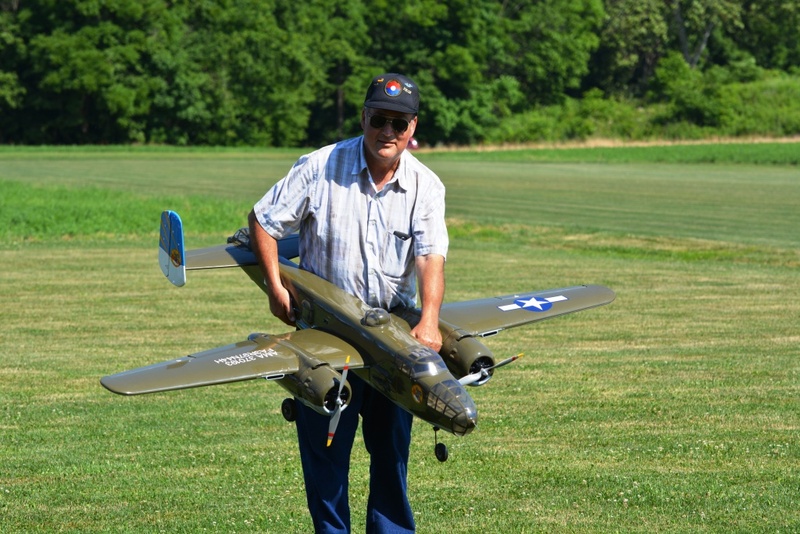 Roger Dohm proudly displaying his Pilots Choice E-Flite electric B-25. 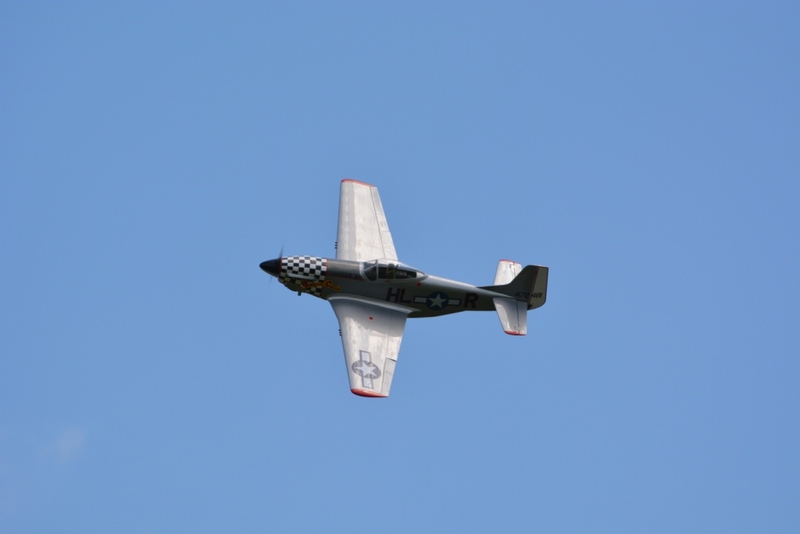 Joe Hartsock's P-51 taking to the air. 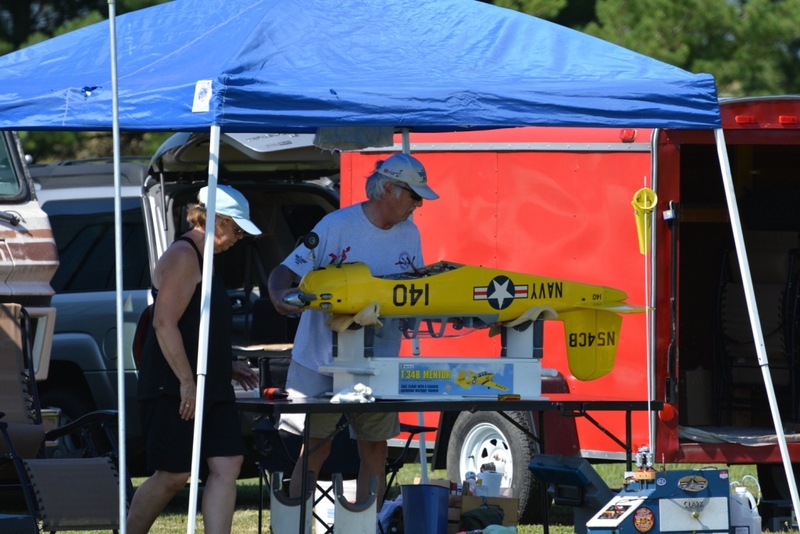 Clark Boncquet with his beautiful kit built Top Flite T-34 Mentor, sara Jean Rees assisting. 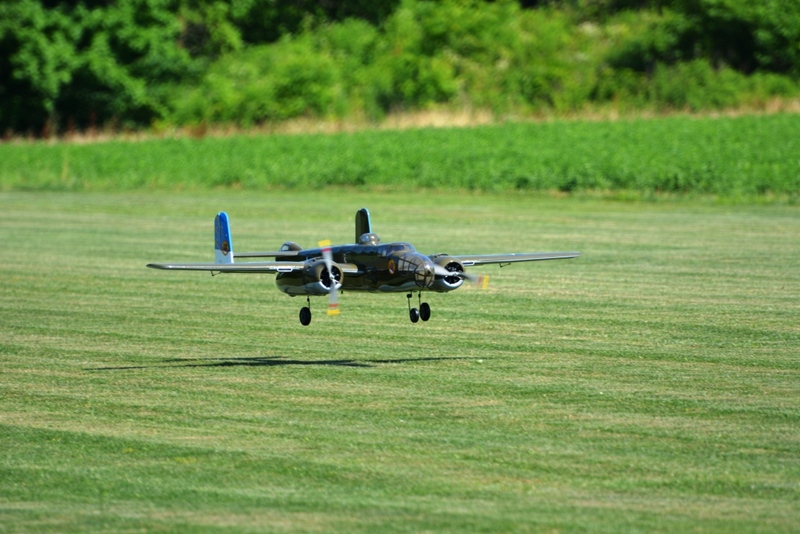 Roger Dohm's B-25 taking off and then landing. 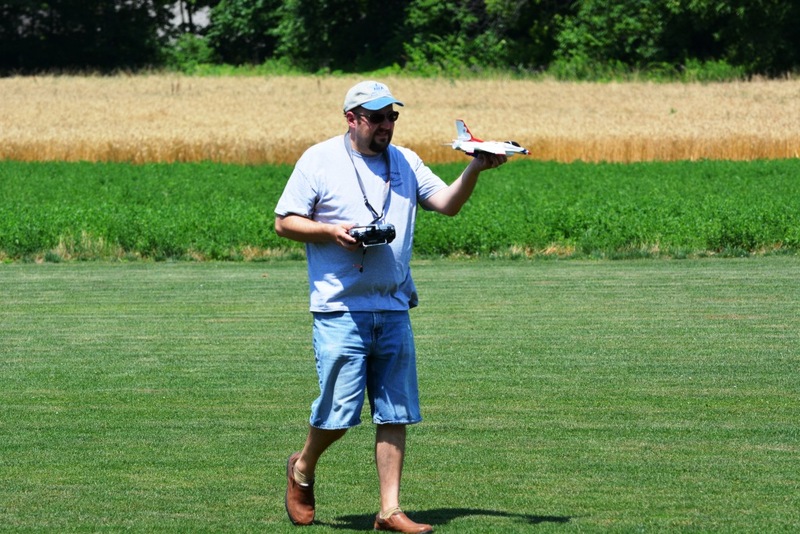 Scott Martin with an FMS p40 Warhawk. Warren Esteps impressive fleet of warbirds. 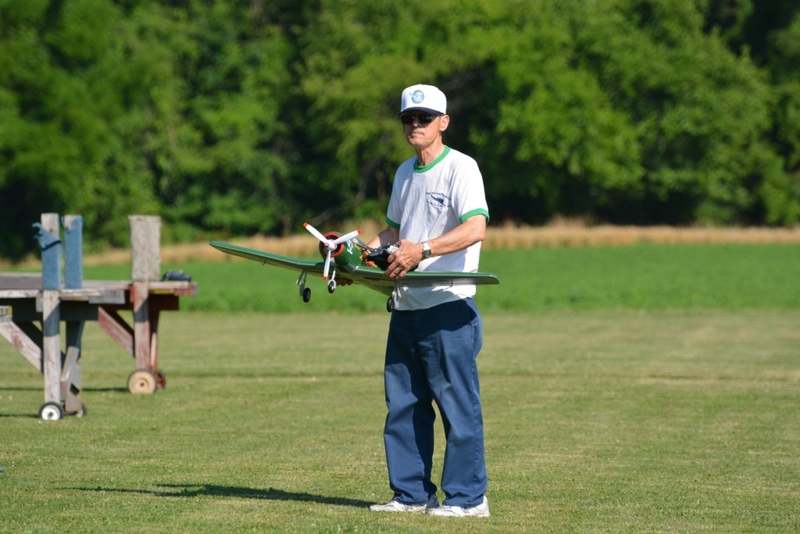 Dave Miller with his very nice Top Flite Elder. 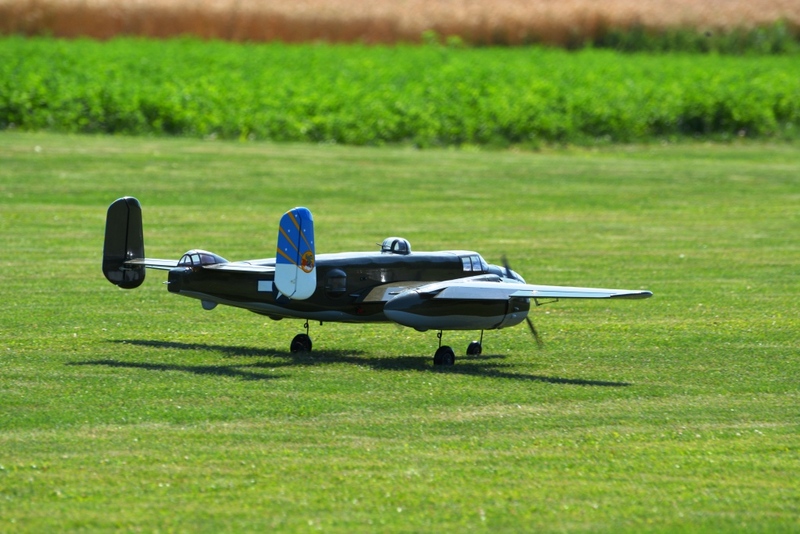 Scott Martin in the foreground and John Lawyer taking his electric P-38 to the runway. 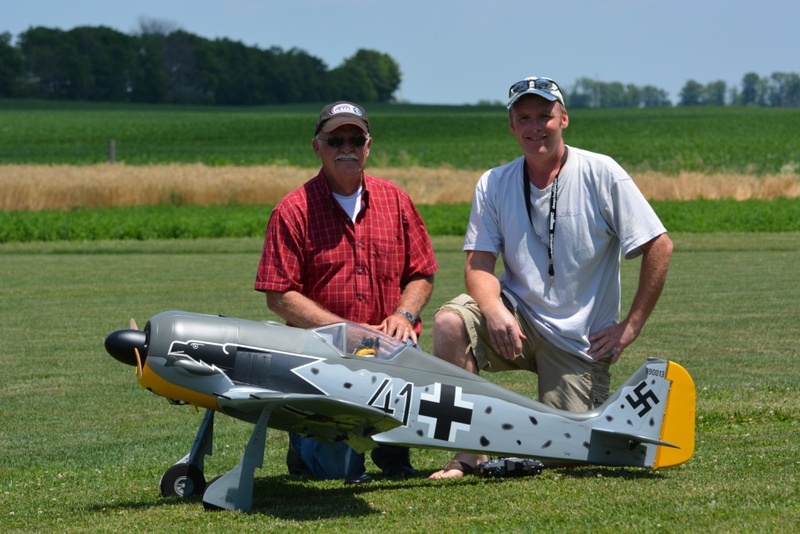 Kyle Bushman and Steve Bushman with Kyle's Top Flite P-47 Thunderbolt. 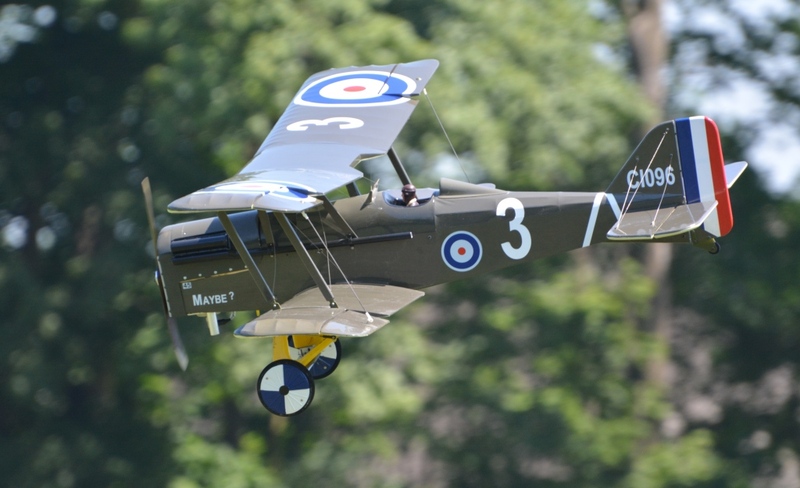 Tom Hatfield's SE5 biplane, powered by a DLE 30cc gas engine. 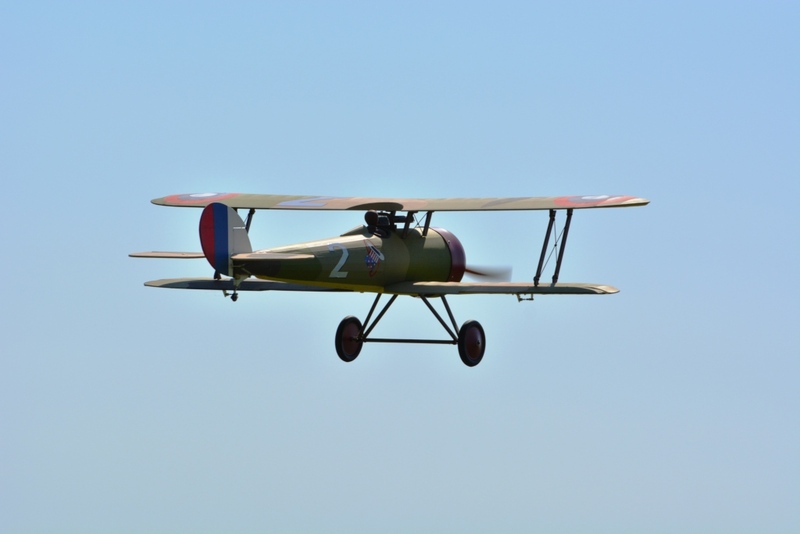 The SE5 in flight, very nice!. 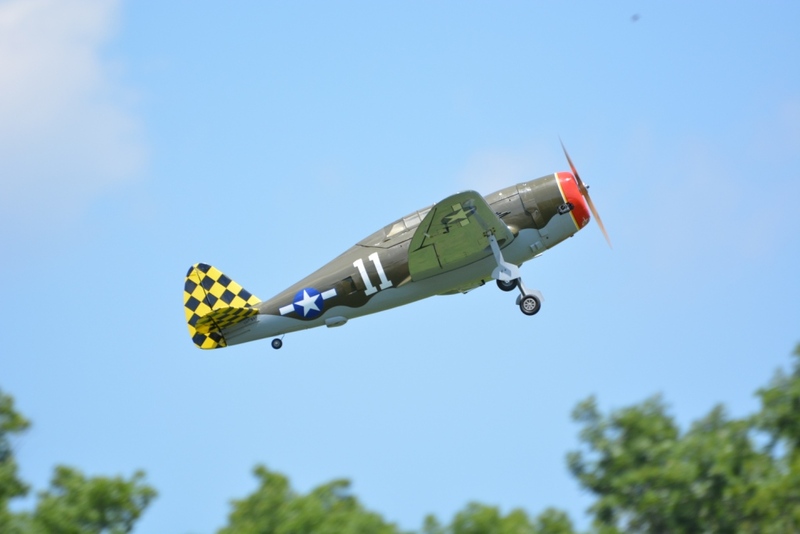 Joe Miller's FMS P-47 Thunderbolt. 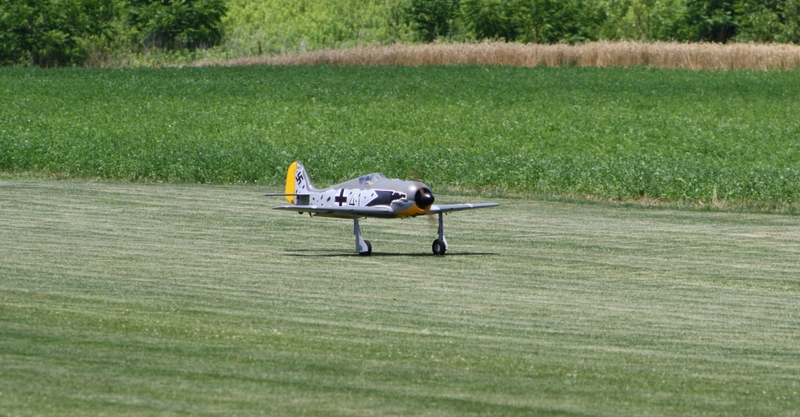 John Lawyer's Seagulll Models Dauntless. 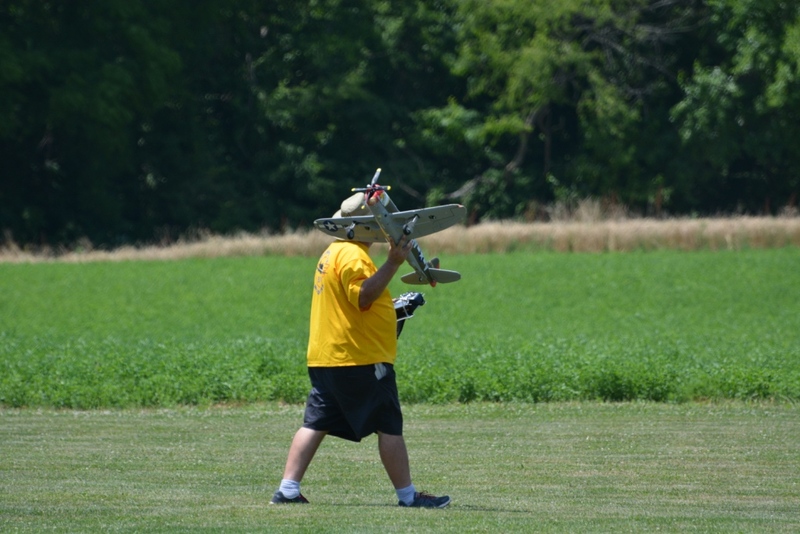 John Killinger flying his Hobby Zone FW. 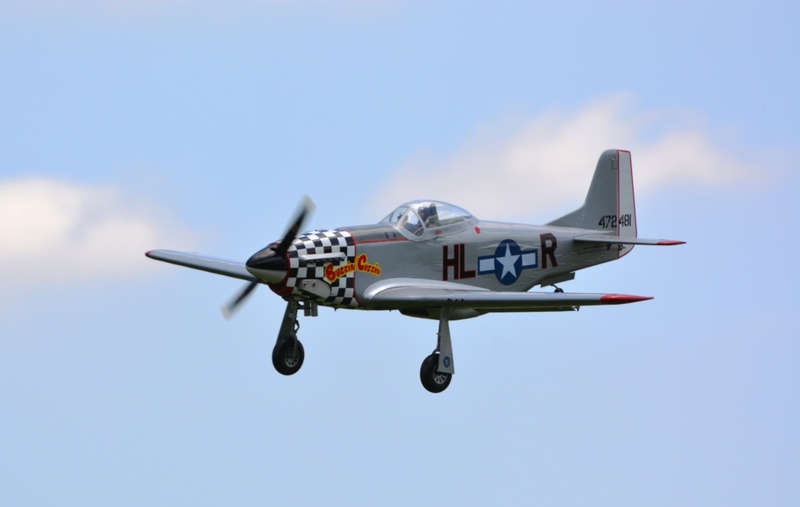 John Louden's Buzzin Cuzzin' P-51 Mustang. Powered by a Turnigy 50. 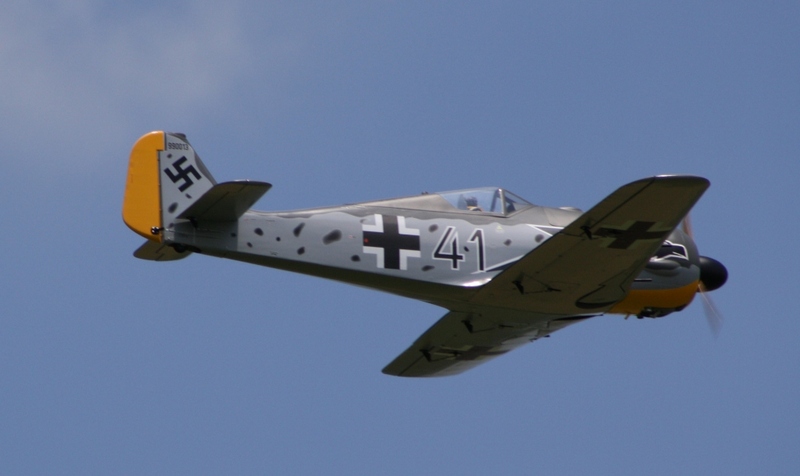 This plane is a past award winner at our warbird fly in. For you older pilots, is it live or Memorex, looks very authentic in the air. 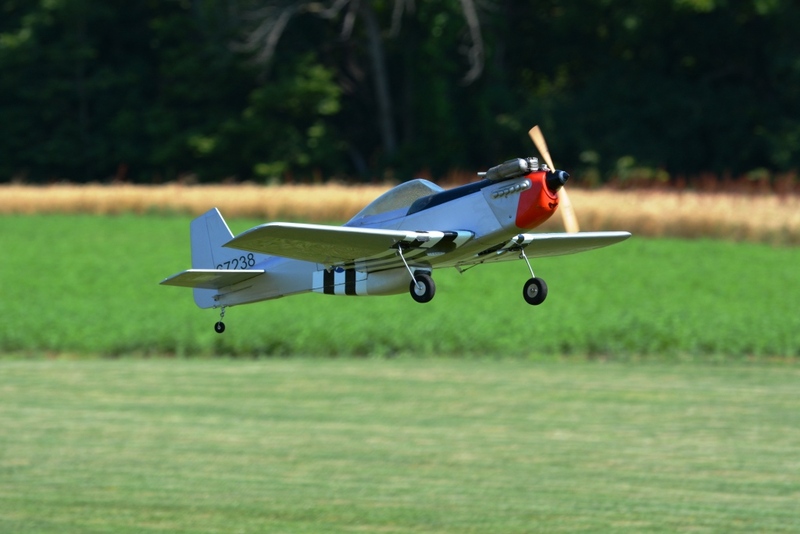 Roger Dohm taking his E-Flite T-28 to the runway. 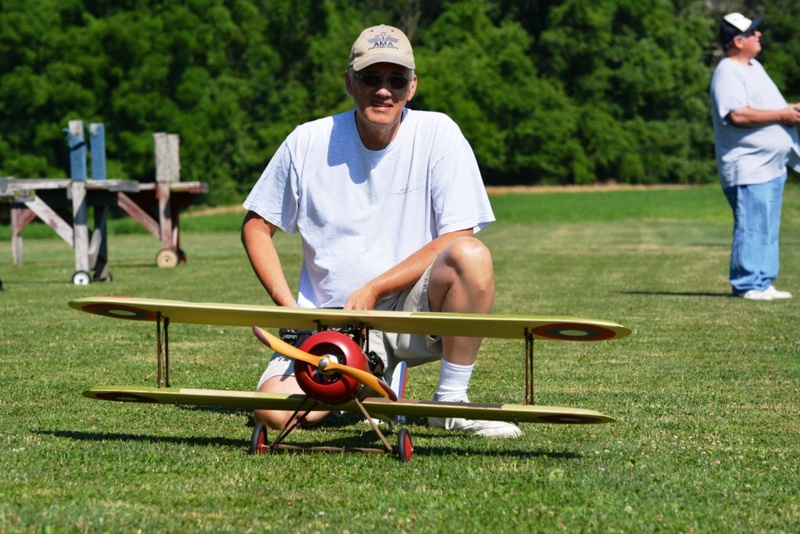 Eric Munevar with his electric Corsair. 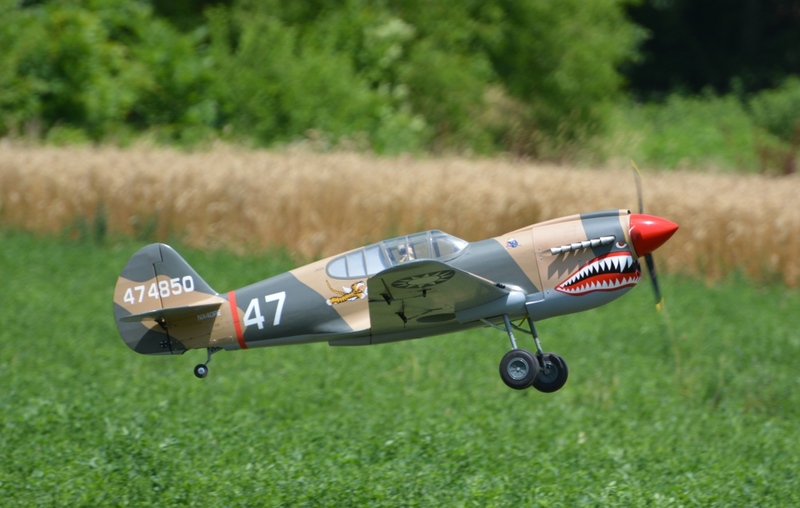 Kyle Bushman's Top Flite P-40 Warhawk. Homemade scale exhaust, flies very nice. 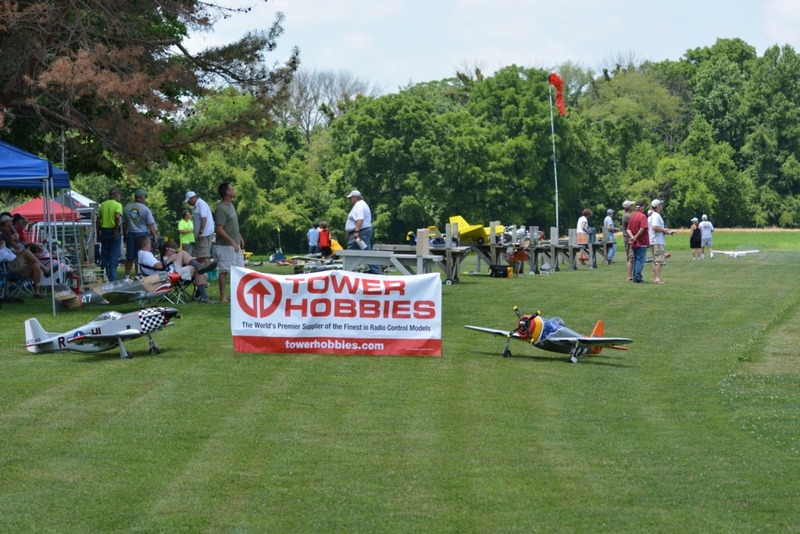 Shot of the flight line with one of our sponsors banners in place, thank you Tower Hobbies!. 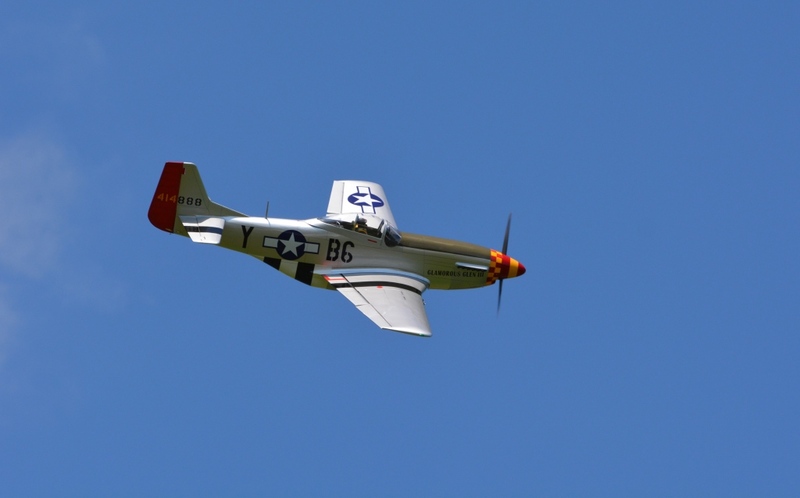 Steven Woods giant scale P-47 Thunderbolt. 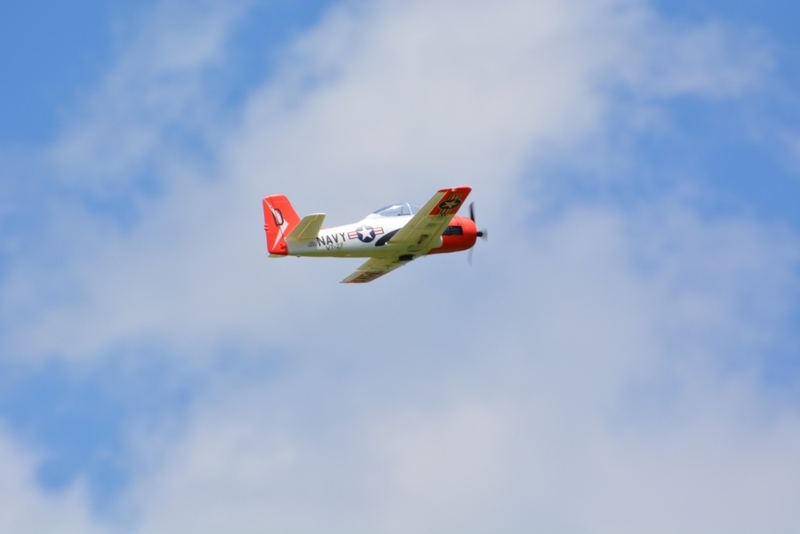 Joe Miller making the circuit with his Hobby King T-28. John Killinger's giant stick, it looks WWI, so we let him chase Snoopy. Gary Melkey's ginat stick powered by a twin cylinder engine with homemade custom exhaust, sounds very cool. 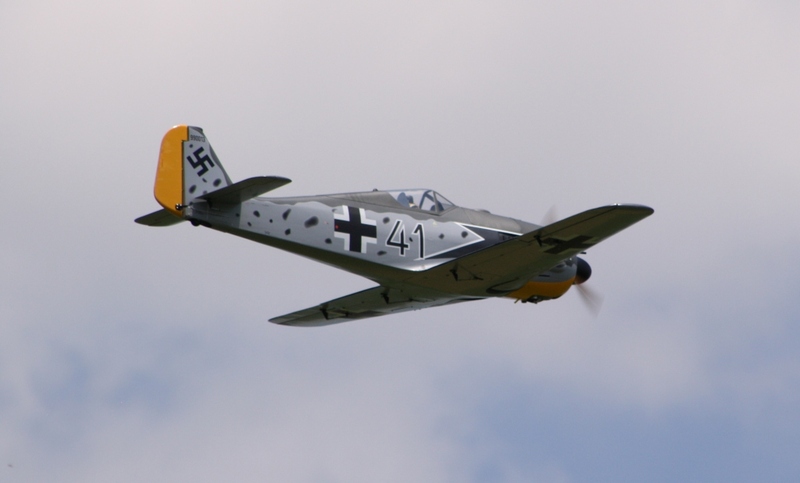 Tom Hatfield's FW190 in flight, great job flying it, Tom. 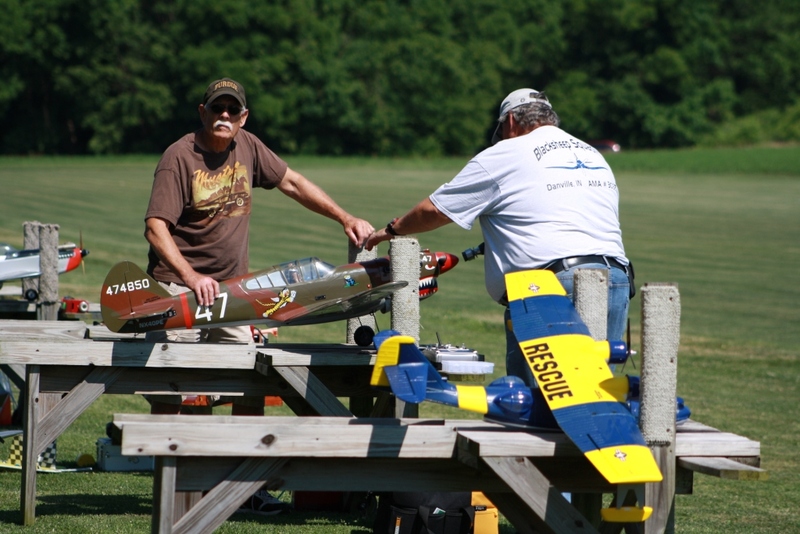 Tom L. Hatfield and Tom E. Hatfield with Tom E's Top Flite FW 90, also a past event awards winner. 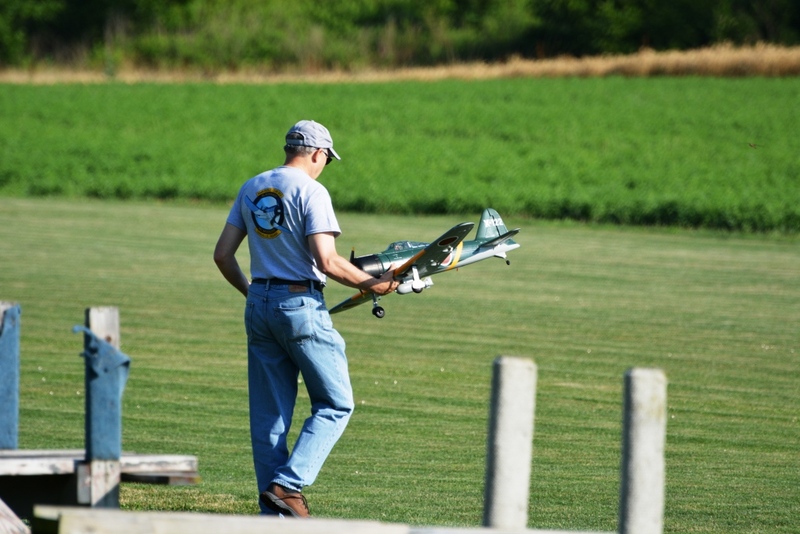 Steven Wood headed to the flight line with his electric P-47, seen this fly many times. 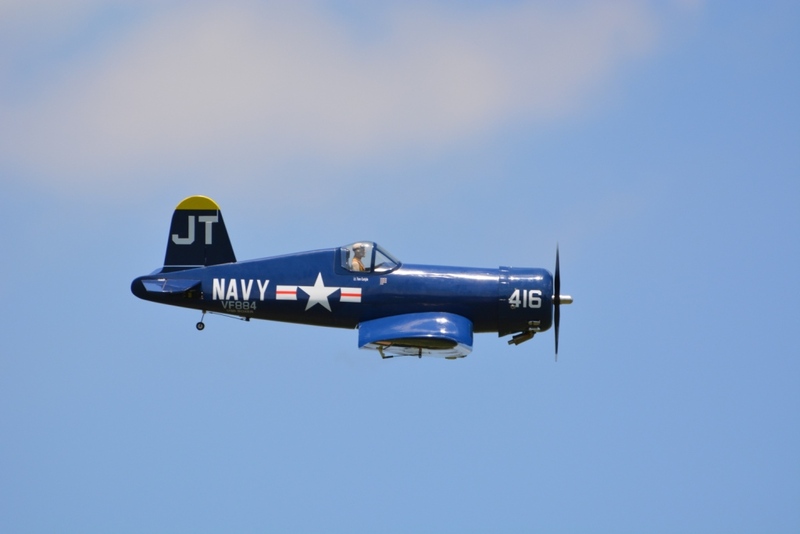 Tom Carlyle's Directors Choice Hangar 9 Corsair in flight. 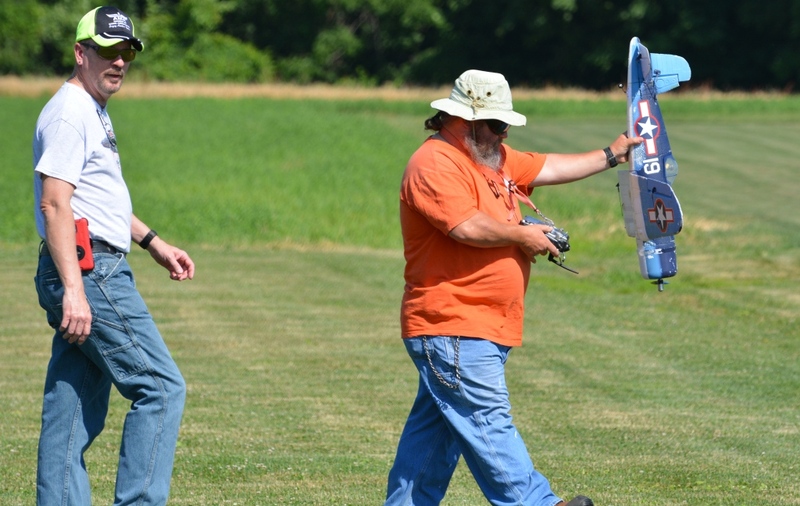 Eric Munvar hand flying his E-Flite UMX F-16. 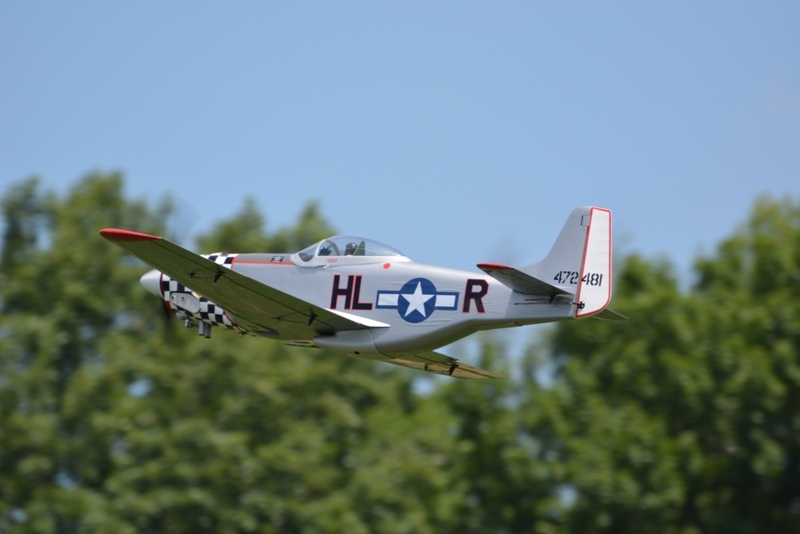 Rege Hall's Glamorous Glen III 89" wing span P-51 Mustang. Features full cockpit, sequencing gear doors, sliding canopy, ordnance drop hard points, panel lines and an ill behaving DLE 60. 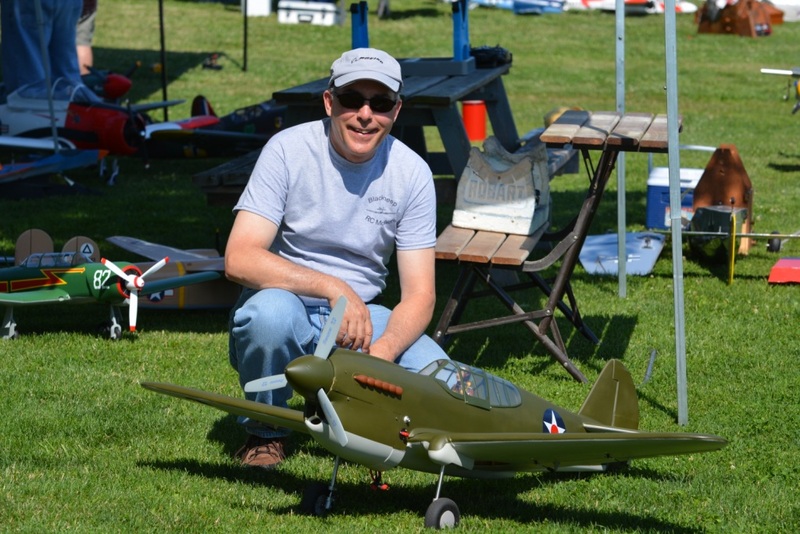 Warren Estep with his giant scale foam P-40 Warhawk, flew good and has a neat ejection canopy on it. photos below courtesy of Kyle Bushman. 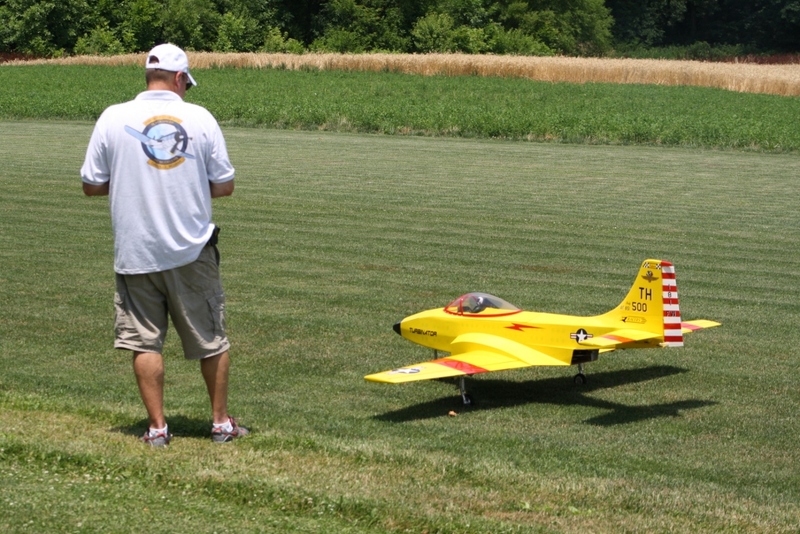 Rege Hall taxiing out his Turbinator, powered by a King Tech 120. 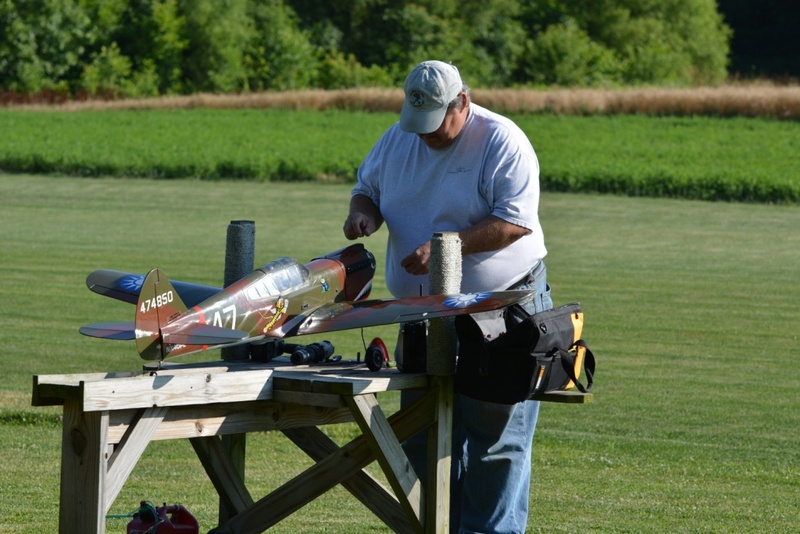 Rege getting ready for a flight with his Hangar 9 P-51 in Chuck Yeager scheme, powered by a DLE 60. 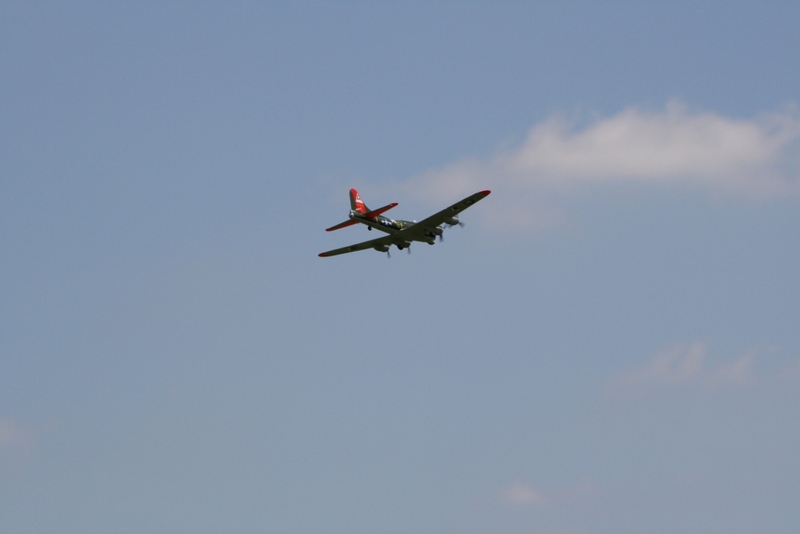 Btyan Paris' B-17 powered by 4 OS Max glow engines. 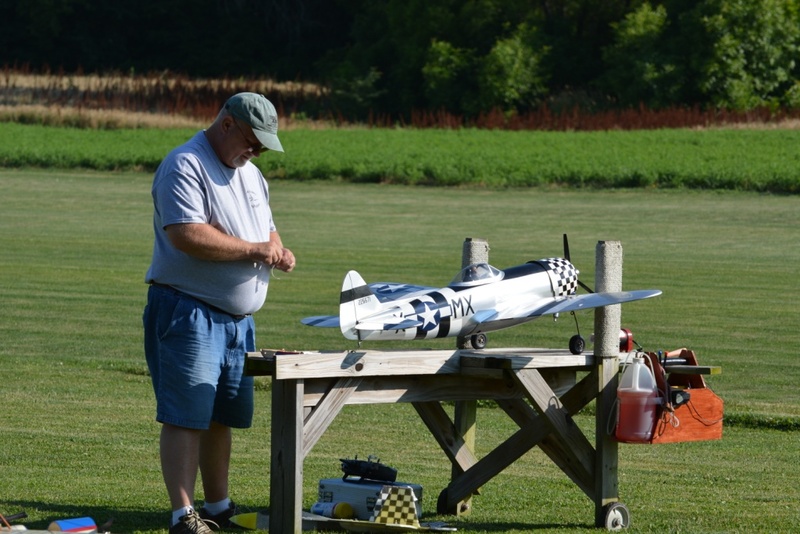 Don Schmedake propping his Hangar 9 P-40 Warhawk, 15 cc gas engine. Tom Elson assisitng. 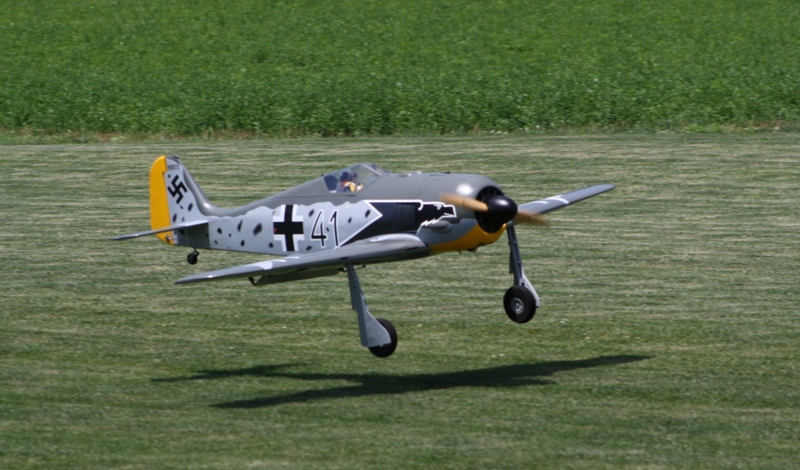 Tom E. Hatfield's Top Flite FW 190, powered by a DLE 55, very nice in the air. 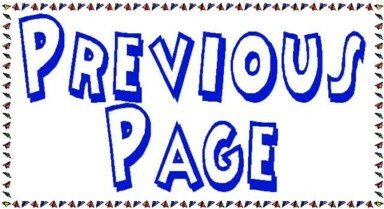 If you have some photos that you took forward them to me. Blacksheep webmaster.